This season, treat your loved ones near and far to the gift of freshly baked and perfectly packaged sweet treats. Here’s how! Note: No cookies were harmed in the making of this video. We promise. A huge THANK YOU to local bakery, Cookies by Jess for providing the tasty delights featured in our Cookie Packaging 101 video. Check out her beautiful creations on her website or reach out to her on Facebook! Make sure your cookies, cakes, or any other precious items are safe by creating a protective environment with a lot of cushion. Wrap using FDA approved, food-safe cello bags, layer on the bubble wrap, and fill in any empty spots with crinkle cut. When used together, these items can help protect your cookies from bumping into each other and cracking during the commute. To ensure your baked goods stay fresh longer, wrap each one in an FDA approved cello bag. For this, we like to use self-sealing, lip and tape bags because they’re quick and easy to use. Add an extra cushion to your individually packaged cookies with bubble-out packaging bags. Their simple bubble design gives each cookie another layer of protection to discourage unwanted cracking. After your cookies are snug and wrapped up, take your pastry box and line the bottom with a layer of tissue paper. Place your cookies into your box and fill any empty space with protective crinkle cut shred. The accordion shape of crinkle cut shred surrounds your cookies and provides a protective cushion. Finish by covering with tissue paper, sealing your box with washi tape, and wrapping with a beautiful satin ribbon. After your cookies are packed, protect this package with a larger, heavier duty shipping box and large, loose fill designed for long distance commutes. For this, we like using RSC Corrugated Cartons and large, loose packaging peanuts. First, line the bottom of your carton with loose fill. This creates a comfy and cushioned layer for your holiday cookie package to rest on. Next, place your cookie package into the center of your carton. Fill any empty space with loose fill. 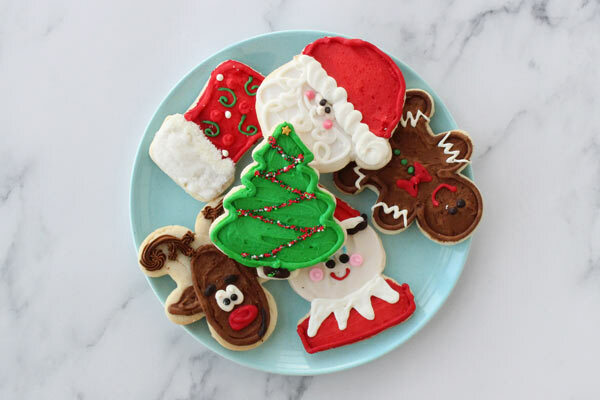 When you’re filling in your empty space, your cookies are less likely to move around and knock into walls. Close your box and seal with heavy duty carton packing tape. Finally, address your package and send it off! 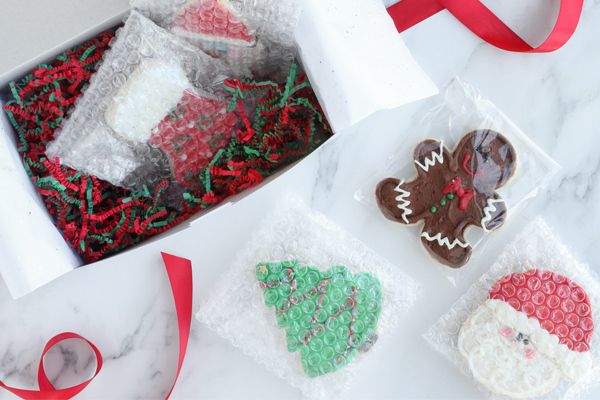 With these holiday cookie packaging and shipping tips, you can send your baked goods with ease this season. Loved this How-To? Us too! We’ll be making more all year long, so stay tuned for more DIY videos, tips for small businesses, and product features! Hi, I want to send uniced cut out cookies to my niece. Could I package/mail them the same ways as your video without them breaking? Yep! You can package your uniced cookies the same way to prevent them from breaking during shipment. Feel free to let us know if you have more questions :).